San Bernardino mass shooting: Inland Regional Center site of fatalities. Update, 9:45 p.m.: There is still no official word from police on the identity or motives of the shooters, but NBC’s Southern California affiliate is reporting that multiple sources have confirmed that one of the shooters was U.S. citizen Syed Farook. Authorities also believe Farook’s brother was an accomplice, NBC News reports. There is still no information on the identity of the female attacker who was shot and killed by police. Update, 9:20 p.m.: New York Daily News front page preview. Update, 9:05 p.m.: During the press conference, San Bernardino police chief Jarrod Burguan also said that law enforcement is still working on searching and securing the Inland Regional Center. Suspicious devices believed to be explosives were found and it will likely take several hours for the bomb squad to complete its work, Burguan said. Update, 8:48 p.m.: In a press conference Wednesday evening, San Bernardino police chief Jarrod Burguan said in the aftermath of the shooting police followed tips to a residence in nearby Redlands. A vehicle was seen leaving the house and officers followed in pursuit. A gun battled ensued and ended with the two suspects, one male and one female, being shot and killed. One officer was injured during the stop. The deceased suspects were dressed in assault-style clothing and were armed with assault rifles and hand guns, Burguan said. A third person was seen running away from the scene and was detained although it has yet to be confirmed that the fleeing suspect was connected to the shooting. After the suspects were shot, police surrounded the vehicle and proceeded with caution out of concern that explosives may be in the SUV, Burguan said. Update, 8:14 p.m.: Police search house in neighboring town of Redlands. Update, 7:05 p.m.: San Bernardino police confirm that one officer has been injured. Update, 6:45 p.m.: Details remain scarce about how the shooting transpired at the Inland Regional Center. CBS is reporting the shooting took place at a holiday party. 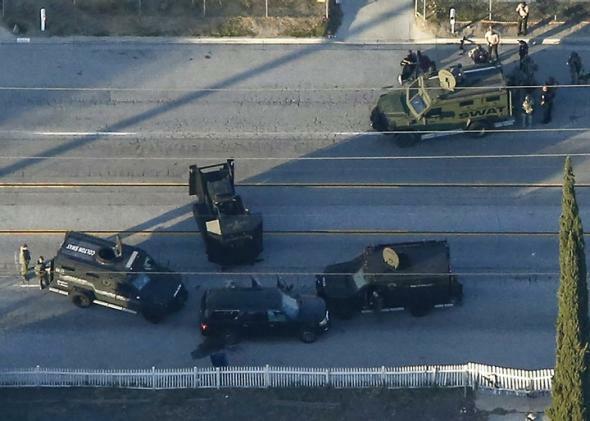 Update, 6:30 p.m.: Shots were reportedly fired just after 6 p.m. during the manhunt for three suspects in San Bernardino and local police are saying one suspect is down. The dark SUV that is believed to have served as the getaway car for the three shooters is currently surrounded by police in armored cars. The vehicle appears to have been shot up and disabled. Update, 5:05 p.m.: San Bernardino police chief Jarrod Burguan said at a press conference moments ago that 14 people have died in today’s shooting. He said up to three individuals with “long guns,” rather than handguns, were involved and that the suspects are believed to be at large. Update, 4:50 p.m.: CNN and Reuters are reporting that today’s shooting appears to have targeted a group of San Bernardino county officials who were holding a holiday banquet in a conference center on the Inland Regional grounds. CNN says the gathering may have specifically involved county health officials. A San Bernardino police officer interviewed live on KABC confirmed that the incident involves fatalities but said she did not know how many have died. An eyewitness interviewed on KABC said that the shooter he saw appeared to be dressed in military fatigues. Update, 3:25 p.m.: Here’s a live coverage feed from ABC. Original post, 3:03 p.m.: Police in San Bernardino, California are on the scene of a mass shooting at a social services center; it’s not yet known how many shooters are involved—some reports say there are as many as three—and no suspects have yet been apprehended. Multiple outlets say that as many as 20 people may have been wounded. The Inland Regional Center is a sizable complex that provides services to people with developmental disabilities and employs 670 people, its website says. San Bernardino is about 60 miles east of Los Angeles.